In DEEP SPRING , my household has finally emerged from its state of FUYUGOMORI (冬篭り), the shuttering up, bundling up, and holing up, that those of us living the traditional Japanese way do (that means without central heating!) for a few months out of each year ( though we have not yet completely emerged from the gloom brought on by the earthquake of March 11th). Now, when I sit in my quake-cracked tatami-matted Japanese style room, instead of huddling up by the noisy little kerosene heater or hunkering up with my legs roasting in a kotastu (a heated table), I can open the large windows, one set facing the garden, and the other the DOOMED Nakane Konda-Dai woods, and let the warm, pollen heavy ( radioactive) breezes drift in, occassionally bringing the intoxicating scent of some newly blossomed flowers to my nose. With this delicious air, and the raucus chatter of birds busy with their mating and nest making rituals, it is just about impossible to concentrate on reading , writing, or anything else for that matter. The only option seems to be to savor the moment. The other day, while I was doing just that, the breeze turned to a gust, and the air filled with fluttering cherry blossom petals, blown off of my neighbors large tree, creating the illusion of snowfall. Many of these settled in my yard, forming a delicate pink mosaic which seemed alive as it shifted with the wind. With an UGUISU (Japanese bush warbler) crying out its distintinctive call, I had the feeling that I was experiencing JAPANESE SPRING to its fullest. What makes the falling of this flower so special is that unlike the plum, cherry or peach, the other blossoms representative of Japanese spring which fall away PETAL BY PETAL, the camellia flowers drop off WHOLE ! This creates a unique scene under the tsubaki trees, which are so common in Japan- large bunches of intact flowers strewn on the ground. For the samurai, this was a gruesome picture, reminiscent of the lopped-off heads of dead warriors, and that is why to this day you will hear many Japanese say that dropping camellias are disturbing, and that they would never plant them in their gardens. It is also held to be common sense by many Japanese that this flower should not be offered at temples or given to people sick in the hospital. This CANNOT be said to be THE RULE, however, as it is plain to be seen that camellias of all sorts can be found ALMOST everywhere you go in Japan, even at temples. Samurai ethics did not permeate Japanese society THAT thoroughly. 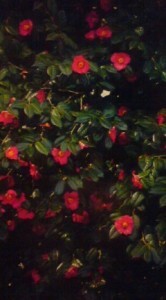 One reason for the camellia`s popularity is its deep beauty. Its leaves are a rich green all year round, and its flowers are a sensuous red, pink or white. The fact that the flowers bloom in early spring (or late winter) have made them an important symbol of that season. In fact, the character used to write tsubaki is not the same as that used in Chinese. It is an original Japanese character (KOKUJI), that uses Chinese elements which mean SPRING TREE (椿）. Because of its evergreen folliage and flowers which bloom in the cold of the early year the year, the camellia had been considered a sacred tree long before the samurai class started frowning upon it. The Emperor, his family and the court used carved ritual sticks of camellia wood, called udzuchi (卯d槌)and utsue (卯杖), to beat the ground and drive away evil, around the New Year. Some scholars also believe that the numerous sacred camellia groves which can be found along the Japan Sea side of Japan were planted by wandering mendicant nuns called BIKUNI (比丘尼), who used camellia wood to perform various rituals. Another reason for the camellias popularity throughout Japanese history is the many products which can be made from it, the most important being all sorts of oil, which were used for cosmetic purposes (especially for hair), for cooking, fuel etc. The wood is also utilized in many ways, including the making of dye from its burnt ashes, and various tools and weapons. 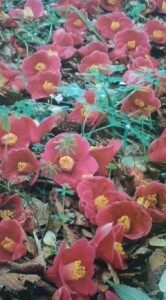 It also became a major flower to be used in the Tea Ceremony. The reason for this is interesting- it has NO SMELL and while while adding beautiful color and form to the occassion, does not interfere with the aroma and flavor of the tea. Camellias are native to East Asia and they were introduced to Europe and then America, from Japan, in the 18th century, and these JAPANESE ROSES became all the rage, and stand as one of Japan`s most important exports of past ages. So keep your ears and eyes open for these most distinctive of Japans spring soundscapes and groundscapes. The camellia flowers, lying unbroken on the ground and the BOTO, the gentle thud of its hitting the ground. Tsubaki ochite kinou no ame koboshi keri (椿落ちてきのふの雨をこぼしけり) which I translate as- A tsubaki flower falls- and look! Yesterday`s rain comes splashing out! There are about 250 varieties of tsubaki, and they can be found throughout Japan (except for Hokkaido). Young Women in HAKAMA Means it`s GRADUATION SEASON in Japan- But why HAKAMA and not just Kimono? This report is very fun. I agree with you that many Japanese like the falling of pure camellias. On the same score we Japanese like peonies. Beautiful falling flowers translate into the samurai spirit and Buddhism. Many Japanese feel the breath of spring in the mutability around them.